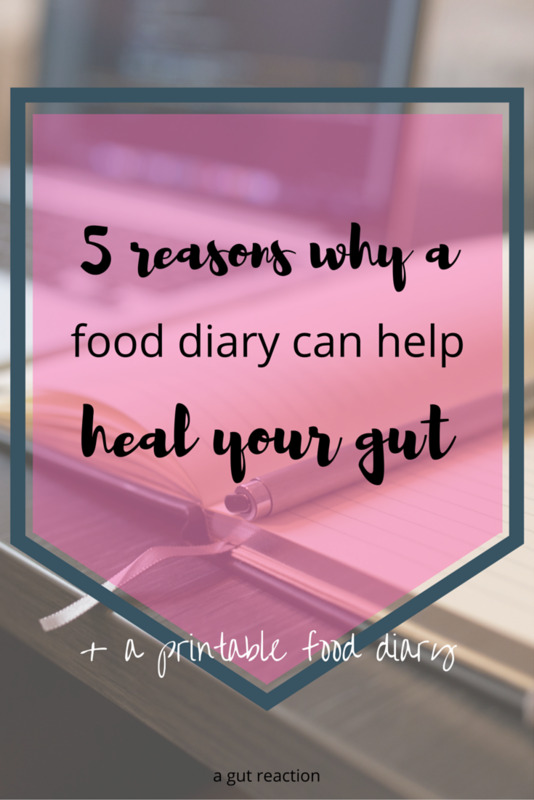 When I was trying to figure out all of my food intolerances and what was causing my gut issues, I came across the idea of a food diary and it had a major impact on healing my gut. The importance of a food diary has also been confirmed through my studies, because a nutritionist can't help you if they don't know what you are eating! If you experience bloating, diarrhoea, constipation, gas, indigestion, abdominal pain etc then a food diary can help you figure out what may be a trigger for your symptoms. It's also important to also seek individual medical advice about your issues. This could be a doctor, a nutritionist, naturopath, a dietician or another health practitioner that has gut health expertise as they can help rule out any underlying serious conditions. If you have been given the all clear but are still having issues, or perhaps they have said its “just” IBS, then this tool can be great step towards good gut health! Here are just a few patterns that I figured out from using a food dairy: potato = bloating, plane travel = constipation, work stress = bloating. Now some of these connections weren’t permanent for me. As my gut healed some of these triggers went away and sometimes they were replaced with something new. However, the food diary helped me understand and see the patterns. Ok so I want you to think of everything you ate yesterday. Can you remember everything, and I mean everything? How much water did you drink? Can you remember how you felt after each meal or snack? How many times did you go to the toilet? Were you happy, tired, stressed? Now it's likely that could give me a brief overview of your day, perhaps in more detail if you are a routine kind of person, but for most of us it's going to be pretty tough to recall everything. Now try and remember what you ate three days ago. Even harder right! By writing down where you are, what goes into your body, what comes out of your body and how you are feeling you can then easily recall what you have been experiencing to help you understand your symptoms and possible triggers. Sometimes something that you did or ate two days ago can have an impact today. When you are trying to figure out patterns or causes, it can be confusing. You might not have done or eaten anything today that would cause an issue and yet you are having problems. That's because it could be from something that happened yesterday. By using a food diary, you can see the bigger picture. You might think that you have an intolerance to dairy but through using a food diary you might realize that it’s milk that's an issue and butter is ok, or that red meat every day can make you constipated but once a week has no ill effects. Whatever may be happening, it can highlight what you may currently have an issue with. Then you (or you and your practitioner) can decide whether you need to take a break from that food for a while or alter when you consume it to see if it makes a difference to your symptoms. Plus it can also help you prepare better. I now know that plane travel is a trigger for me so I have to be extra diligent, take the right snacks, relax and even meditate on the plane. If you have decided, or had it recommended that you make some dietary changes then the food diary can help you be accountable. You can’t hide when its in black and white. If you’re about to reach for your third coffee for the day when you wanted to stick to two, you may hesitate if you know you have to write it down. Or if you have decided to increase your intake of green veggies to two meals a day and you actually do it, then that good step is recorded. Awesome! So how do you use a food diary? It’s as simple as recording what you have consumed, what symptoms you have been experiencing, the all important bowel movement details and where you have been when all of this occurred (because life situations can have a big impact on gut issues – you can read about my work story here). Now you could use an app to record everything, but I think that there is just something about writing it by hand that makes it more real, plus you don't have to scroll through different entries to understand the bigger picture. You can record the details for three days, a week or even longer, it’s up to you. I’ve done about four of them for about a week in the last two years, so it's not a forever thing. When I was searching for food diary examples to print out, I found that they didn’t have enough space to write everything down and they didn’t include the right questions. So I created a downloadable and printable version based on what I found the most useful, and now I'm sharing it with you! Click here to get your copy. Good luck! I hope you find it as valuable as I did!